In the past few months I have tried to provide some general historical information about Newark, its neighborhoods and famous visitors. Additionally, I've taken our readers on mini-tours of various areas of the city and described some of our most important buildings. Ideally, these articles would have been preceded by a description of Newark's geology, geography, and climate. With apologies for not doing so earlier, let's move back to square one and take a look at Newark before it had people. This might help us to understand the city better as we continue to tour it from north to south and from east to west. Geographically, Newark occupies a very small land area. In a study that John O'Connor and I did in 1976, we attempted to show that Newark was the smallest city in land area in the whole United States having such a dense population. If we had retained the original boundaries at the time of the Revolutionary War, we would still encompass much of modern Essex County and beyond with the results that one might live in the Montclair section of Newark, have a business in the Fairfield region, or operate a factory in the Belleville district. As the county seat of Essex County, Newark is located on the Passaic River with an ocean doorway to the world through Port Newark and Newark Bay. Its latitude is 40 degrees and 40 minutes, and its longitude is 74 degrees and 10 minutes. The terrain is generally flat with marshland found mostly in the eastern section. The land gradually sweeps upward as you travel west and north. To the west of Newark, in the area once called old Newark Township, are the red sandstone ridges of First and Second mountains which dominate the countryside. These ranges are part of a group of hills which stretch from Trenton through Essex County, crossing into New York State. In early times, the hills were difficult to traverse. It was not until this century that they became friendly to western movement by road and rail. In Newark, the gradually increasing slopes rise to a height of over 200 feet along High Street (King Boulevard) as well as in the Forest Hill section near the Belleville border. Before the Revolutionary War, much of Down Neck in the Ironbound area was farmed by a dozen or so families who grew saltmarsh hay on their 'plantations.' One of the earliest paintings of Newark at the Newark Museum is by Martin Johnson Heade, who recorded the haystacks in the city's meadows early in the 19th century. Not far from the Ironbound, in the adjoining Meadows and across the Passaic, grew the great white cedar trees that were in demand in the colonial era. They were used for roof shingles a product which did not easily decay in bad weather. In addition to the distinctive meadowland flora of saltmarsh hay and ancient white cedars, rose-colored sandstone of the Orange Mountains and that of Newark's own Bloomfield Avenue quarries were a distinct product of the city. Sandstone was considered one of the township's most valuable products throughout the first quarter of the last century. In fact, the Shoemaker Map of 1806 indicated that Newark was important in the making of leather shoes, saddles, and cider, and for the quarrying of brownstone. Newark's earliest quarrying operations began about 1700. As a result, many of our finest buildings were constructed of it, and our best gravestones carved from it. The imposing walls of Old First Church, as well as the Georgian-styled front of the historic Plume House on Broad Street, were both crafted from the local stone. As late as 1881, Newark brownstone was being quarried from three operations along or near Bloomfield Avenue, bringing in $120,000 annually for buildings constructed in Newark, Princeton, New York City, Albany, and New Haven. The Newark Quarry Company operated near Bloomfield Avenue and used a welding operation, not gunpowder, to extract the stone at a cost of 70 cents a cubic foot. William Righter's quarry, later operated by Philip Hoehne, was one of the city's oldest and produced more than 300,000 cubic feet of stone. W.D Patterson operated an adjoining quarry as late as 1880, but the spread of housing and the expansion of Newark to the north resulted in the gradual closedown of operations. There is little, if any, evidence of this activity at all in 1996. Newark's first colonists explored America's east coast thoroughly before settling there in the 17th Century. They were looking for a place to plant their newly formed theocracy in the American wilderness. They wanted to locate on a major river or the ocean, near fresh water, and one of their first acts was to tap the local springs for pure and fresh water. As a result, the town pump at the Four Corners came into existence as both a popular and useful landmark. In addition to the Passaic, Newark has two other rivers, one now covered over, and the other practically forgotten. These two smaller waterways are the First and Second rivers. In the case of the First River, it was completely bricked over in the past century. It can be located only by using early atlases and maps. Now buried completely from view, it flows from an area in the vicinity of the new skaking rink, or the old reservoir in Branch Brook Park, to the Passaic River underneath Seventh and Eighth avenues. In earliest times it was the mill pond along which Newark's earliest industries were built, including Robert Treat's mill in the 1680s. But, by 1863 it was partially covered and by 1891 completely disappeared from view, when a new approach to the Clay Street Bridge was constructed. In Newark's earliest industrial days, it was the center of considerable industrial activity. Second River now serves as the boundary between Newark and Belleville and is a focal point for Newark's great cherry blossom displays in Branch Brook Park. Like First River, it runs from the west, and flows into the Passaic, entering it at a perpendicular angle. A similar pattern is found at Third River which is the dividing line between Belleville and Nutley. In the first 200 years of Newark's history, the Passaic River was not only our chief avenue of transportation and commerce, it served as our water supply until it became so polluted that it had to be abandoned as a source of drinking water. The history of the Passaic and its importance is a long and complicated one, and will be looked into next week. Other waterways, streams more precisely, also have disappeared with the advance of the city. They include Wheeler's Creek, which once flowed from a spring near the Essex County Courthouse east to Washington and Halsey streets, and then turned south to Lincoln Park and onto the meadows. 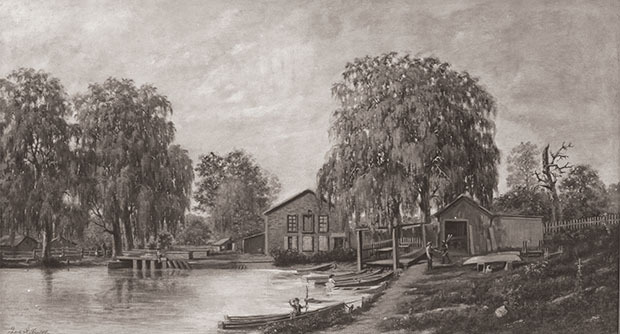 Meadow Brook was certainly one of Newark's most picturesque streams, entering the Second River at Belleville and running along the city's western boundaries. It also served as a feeder for long-gone Silver Lake. In the 19th century, it was channeled into an underground sewer. Since then it has been forgotten. A third lost stream is Two Mile Creek, which rose in the vicinity of Eighteenth Avenue and 19th Street and eventually crossed Elizabeth Avenue. Like Wheeler's Creek, it disappeared into the Newark Meadows. A land of lakes, or the American Venice, were two names by which Newark was sometimes referred to in the local press. The largest was Silver Lake or Sunfish Pond, as it was sometimes called. The pond was a large body of water in the vicinity of Heller Parkway, North Sixth and 13th streets, a body of water comparable to the largest of the Branch Brook Park lakes. On July 30, 1889, Silver Lake was destroyed in a great storm when its dam burst, draining the lake forever. At one time there were 19 ponds here in town, of which only three were natural. Two of them were in Vailsburg one in the western section, and the other at Clinton Place and Hawthorne Avenue. The third was the large lake at Branch Brook Park. Ice ponds provided a bustling business from locations along Frelinghuysen Avenue, Roseville Avenue. A third was Patersons' Pond at Blooomfield Avenue and Lake Street. Many of these lakes were fed by underground streams from First and Second mountains or from tidal waters from the river or bay.